Etiology: Deficiency results from inadequate feed levels or is associated with vitamin A toxicity. Incidence: Incidence of vitamin E deficiency is low in laboratory rabbits. Clinical Signs: Rabbits show signs of reproductive failure with diminished libido and sperm production in buck. There is neonatal mortality, and slow growth and muscular weakness in young rabbits. Non-lop rabbits may have droopy ears. 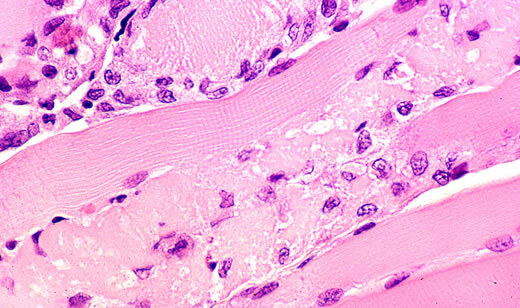 Pathology: Hyaline muscle necrosis is observed. Diagnosis: Rabbits will have low serum α tocopherol levels. Levels < 0.5 µg/ml are indicative of deficiency. Feed levels of tocopherol can also be measured. Levels < 20 mg/kg are associated with deficiency.